Labour productivity of Canadian businesses fell 0.3% in the first quarter, following a 0.2% increase in the fourth quarter of 2017. In the first quarter, business output decelerated from the previous quarter, while the pace of growth in hours worked accelerated and surpassed output growth. Growth in the real gross domestic product (GDP) of businesses slowed to 0.2%, after increasing 0.4% in the previous quarter. The growth in output in the first quarter was mainly moderated by the slowdown in service-producing businesses (+0.2%) due to decreases in real estate and retail trade. However, production growth of goods-producing businesses (+0.6%) continued at a similar pace as in the previous quarter. Real GDP growth in the first quarter was accompanied by a 0.5% increase in hours worked, following a 0.2% gain the previous quarter. Hours worked rose in both goods-producing (+1.1%) and service-producing (+0.3%) businesses, as 11 of 16 major industry sectors increased. The largest gains were in administrative services (+1.7%) and construction (+1.5%), while the biggest decline was in real estate (-2.0%). Hours worked in utilities and arts and entertainment were essentially unchanged. Both goods-producing and service-producing businesses contributed to the overall decrease in productivity in the first quarter. Productivity in goods-producing businesses fell 0.5%, after edging up 0.1% in the previous quarter. Productivity declines in agriculture and forestry (-1.3%), manufacturing (-0.7%) and construction (-0.1%) more than offset increases in the mining, quarrying, and oil and gas extraction sector (+1.6%) and utilities (+0.4%). Productivity in service-producing businesses edged down 0.1%, following a 0.6% increase the previous quarter. Arts and entertainment (+1.3%) and accommodation and food services (+1.1%) increased, while other service industries declined, led by administrative services (-1.3%). In the United States, labour productivity grew 0.3% in the first quarter, after edging down 0.1% the previous quarter. This productivity growth primarily reflected a slowdown in hours worked, following a quarter of strong growth, while real GDP of American businesses (+0.7%) grew at a slightly slower pace than in the previous quarter (+0.9%) and surpassed the growth in hours worked (+0.4%). 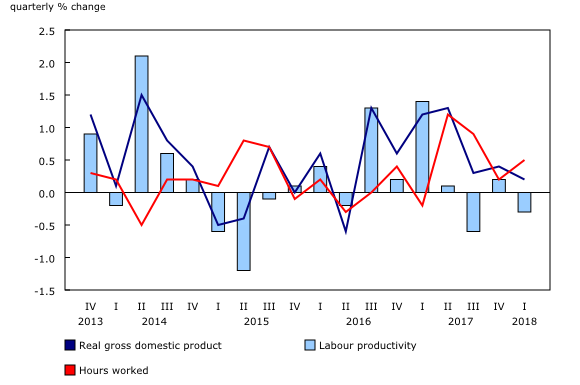 Growth in labour costs per unit of output for Canadian businesses slowed to 0.7% in the first quarter, following an increase of 1.3% in each of the previous two quarters. The slower growth in unit labour costs reflects the slowdown in the average compensation per hour worked (+0.4%), combined with lower productivity (-0.3%). In the previous quarter, hourly compensation rose sharply (+1.6%). In the first quarter, hourly compensation in service-producing businesses rose 0.5%, while it was unchanged in goods-producing businesses. Hourly compensation was up in 9 of 16 industry sectors. Real estate (+2.9%), accommodation and food services (+2.7%) and retail trade (+2.1%) posted particularly strong gains. Following a quarter of depreciation, the average value of the Canadian dollar relative to the US dollar was up 0.6% in the first quarter. Given this appreciation, unit labour costs in US dollars for Canadian businesses rose 1.2%, after edging down 0.2% in the fourth quarter. In comparison, unit labour costs of American businesses rose 0.7%, a rate similar to that reported by Canadian businesses when costs are not adjusted for the exchange rate. With this release on labour productivity and related measures, data were revised back to the first quarter of 2017 at the aggregate and industry levels. These revisions are consistent with those incorporated in the quarterly gross domestic product (GDP) by income and expenditure and monthly GDP by industry, published on May 31, 2018. This release also incorporates the new 2017 benchmark data on provincial and territorial labour productivity and related measures, published on May 23, 2018. The term productivity in this release refers to labour productivity. For the purposes of this analysis, labour productivity and related variables cover the business sector only. Labour productivity is a measure of real GDP per hour worked. Unit labour cost is defined as the cost of workers' wages and benefits per unit of real GDP. All the growth rates reported in this release are rounded to one decimal place. They are calculated with index numbers rounded to three decimal places, which are now available in data tables. All necessary basic variables for productivity analyses (such as hours worked, employment, output and compensation) are seasonally adjusted. For information on seasonal adjustment, see Seasonally adjusted data – Frequently asked questions. Labour productivity, hourly compensation and unit labour cost data for the second quarter will be released on September 5.